Some of the projects listed in Coastwide Civil's portfolio include foreshore and dredging works at Port Botany and Barangaroo and on the Shell Cove Boat Harbour project. 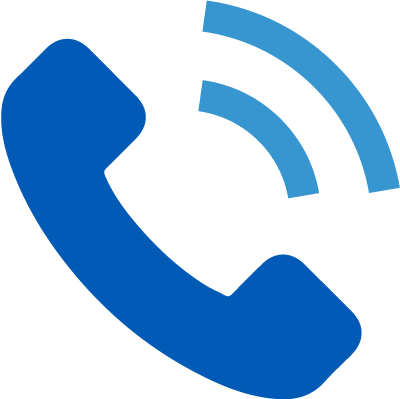 Coastwide Civil have also operated internationally, winning the tender for works carried out on Lihir Island in Papua New Guinea (PNG). Coastwide Civil has been involved with some of the most prestigious marine civil works nationwide and has constructed breakwall and groynes all over the coast of Australia, as well as internationally. With specialised longreach excavators fitted with state of the art GPS equipment this allows Coastwide Civil to excavate and construct below water level, removing the need for expensive requirements such as cofferdams. The $22 million Breakwater & Groyne project constructed for the Shellcove Boat Harbour will be a significant structure based on design principle of an Icelandic Berm. The first of its kind to be constructed in the southern hemisphere, the breakwater comprises of rock in excess of 30 metric tonnes placed with high accuracy and interlocked to form a low maintenance ocean structure. The project commenced in 2016, once completed, the Breakwater will extend 467 metres out into the ocean whilst the groyne (southern wall of the entrance channel) will extend 282 metres. Concrete pathways will be formed on top allowing pedestrian access for the full length of the walls. Since its inception more than 25 years ago, this $1.5 billion development is the largest coastal tourist/residential project ever initiated by any local government authority in Australia. 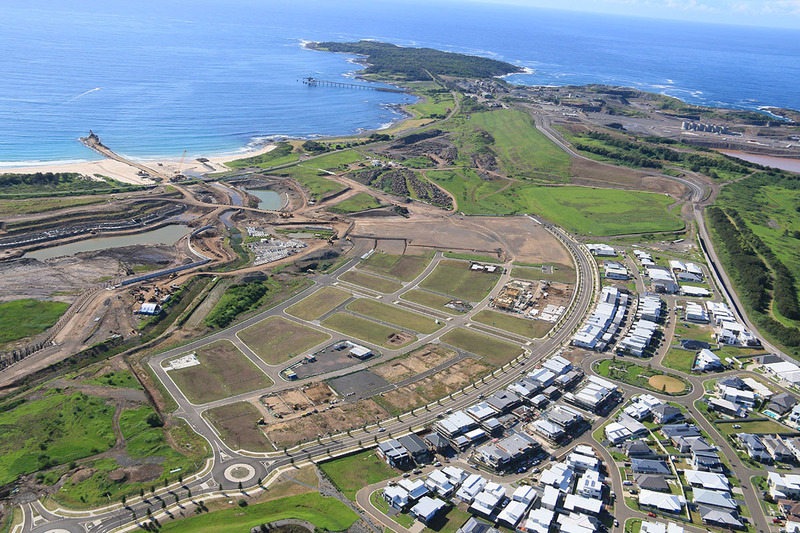 A joint venture between, Shellharbour Council and Australand, the project is a major focus for economic development. Stage 1 construction began in January 2013 and was completed in March 2014. The works included the diversion of the existing outlet channel, the installation of a cofferdam, the management and treatment of Acid Sulphate Soils, the harbour excavation of over 400,000 m3 of material, the sorting, trommeling and crushing of 420,000 m3 of material, the construction of platforms and rockwalls and the placement of temporary surcharge mounds to consolidate soft soils. Stage 2 works are expected to take 3 years and will include the completion of the boat harbour basin. Stage 2 works began in March 2014 and consists of a northern and southern diversion swale, the management and placement of Acid Sulphate Soils, the excavation the inner harbour and outer harbour, edge treatment works, blasting of harbour floor, the placement of approximately 250 concrete piles and approximately 250 timber piles, the sorting, trommeling and crushing of blasted rock and material, the placement and removal of temporary surcharge mounds. Construction of the harbour edge concrete wall and rock revetment started in 2016 and involved the placement of approximately 500 concrete and timber piles to support the L-shaped precast concrete units and the future boardwalk. Port Kembla is one of three major ports in NSW, it was established in the 1890's to facilitate the export of coal in the Illawarra region. 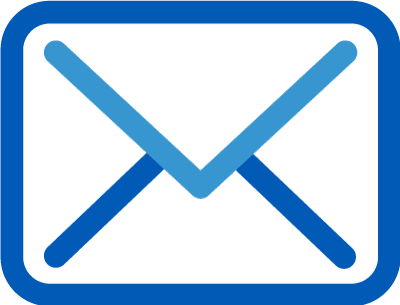 Since then it has undergone and continues to undergo significant growth and the port has seen diversification in the type of trade and the size, type and quantity of ships coming through the port. To assist in improving operational efficiency, Port Kembla's Ports Authority contracted McConnell Dowell to design and build a new tug berth facility. 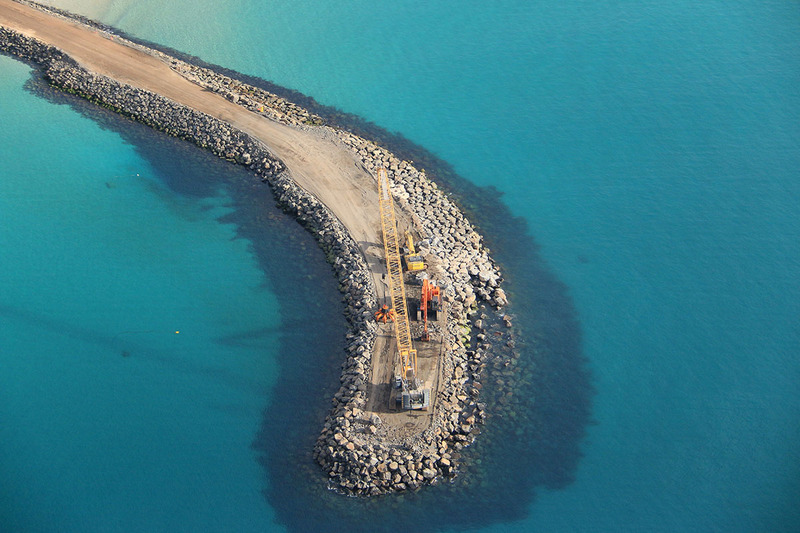 Coastwide Civil completed the reclamation of approximately 3000m² of land and for the construction of an adjoining breakwater approximately 250m long. Coastwide Civil also sourced, graded and transported armour rock for this project and dredged a total of 28,000m³ of material from the harbour. In 2008 Sydney Ports Authority awarded the Design and Construction of the new terminal to the Baulderstone Hornibrook - Jan De Nul consortium. This job encompassed 60 hectares of reclaimed land including five new berths, construction of community features such as new breakwaters, groynes, lookouts and footpaths, and the dredging of 11 million cubic metres of sand. Coastwide Civil's knowledge and expertise in rock revetments, marine civil works including the placement of large volumes of dredged material made them the perfect contractor for this job. 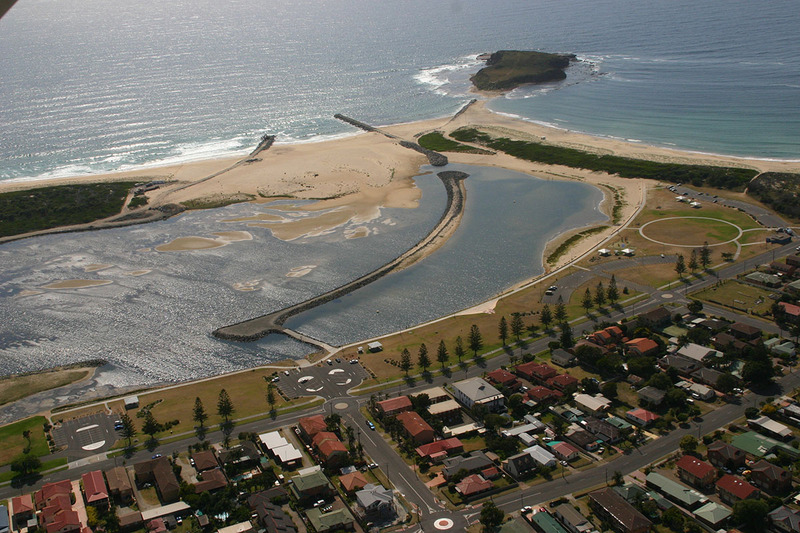 The Baulderstone Hornibrook-Jan De Nul consortium approached Coastwide Civil to construct the breakwaters, groynes and rock revetment structures for the project. Coastwide Civil was contracted by Laing O'Rourke to construct the rock breakwall and revetments in the 20 hectare marine facility. 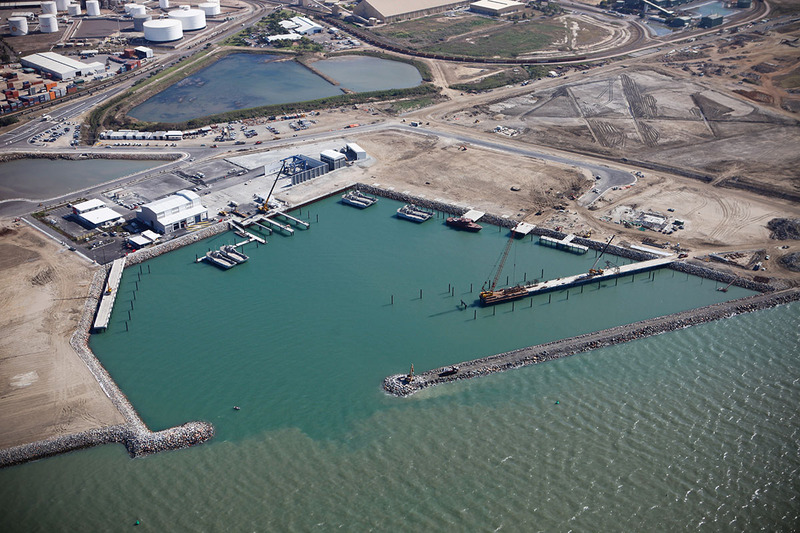 This facility was designed to house Townsville's Commercial fishing fleet as well as being used for a range of commercial, industrial and recreational purposes. Coastwide Civil installed approximately 2km of rock walls and was extensively involved with dredging on site. The project required the utilisation of our GPS fitted long reach and standard excavators in order to construct rockwork to the high specification required. Lake Illawarra is the second largest lake in NSW, with complex and distinctive ecosystems. 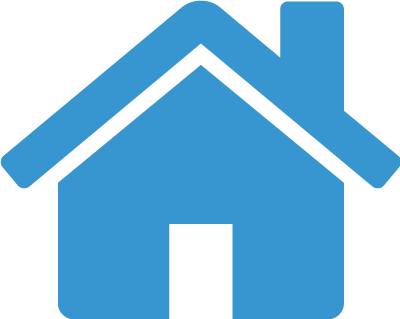 Understandably, this was an environmentally sensitive project, which not only required extensive knowledge and understanding of the work; but a sympathetic approach and a thorough appreciation of the environmental constraints. 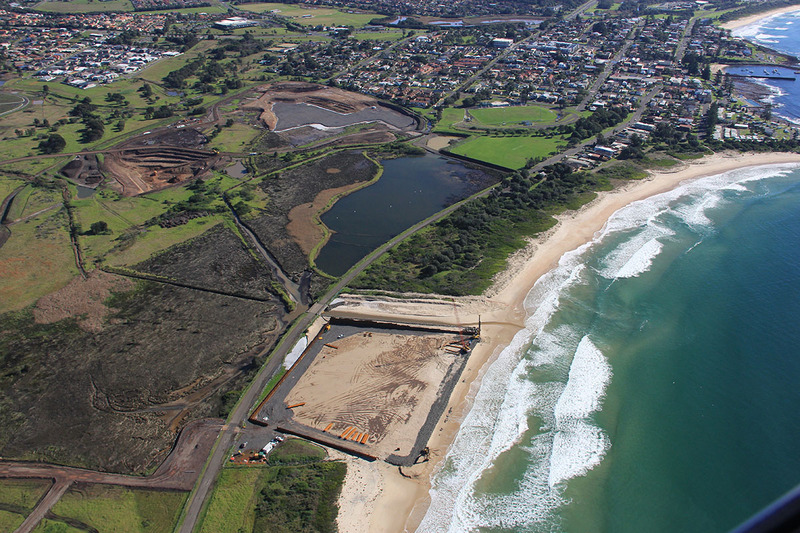 Coastwide Civil's works included, dredging, sandstone foreshore work, the construction of sand dunes including dune vegetation, quarrying of 190,000 tonnes of rock, seawall construction and closing off the existing lake. Upon successful completion of the project, Coastwide Civil won the Civil Contractors Regional and National Awards for Environmental and Engineering Excellence, which brought the company into the limelight. The Lihir Island project on Niolam Island in Papua New Guinea, 900 kilometres north-east of Port Moresby, is 100 per cent owned and operated by Lihir Gold Limited. Coastwide Civil was contracted to carry out refurbishment to the existing breakwalls and construct new breakwalls in order to protect a recently installed power plant and sea water intake tanks. In 2003, the Government of New South Wales determined that the precinct would be redeveloped from shipping and stevedoring facilities to provide more commercial office space and recreational areas. The redevelopment project comprises three precincts: Barangaroo South, Barangaroo Central and the Headland Park. Coastwide Civil was employed by the main contractor to complete work on the foreshore and headland park area. 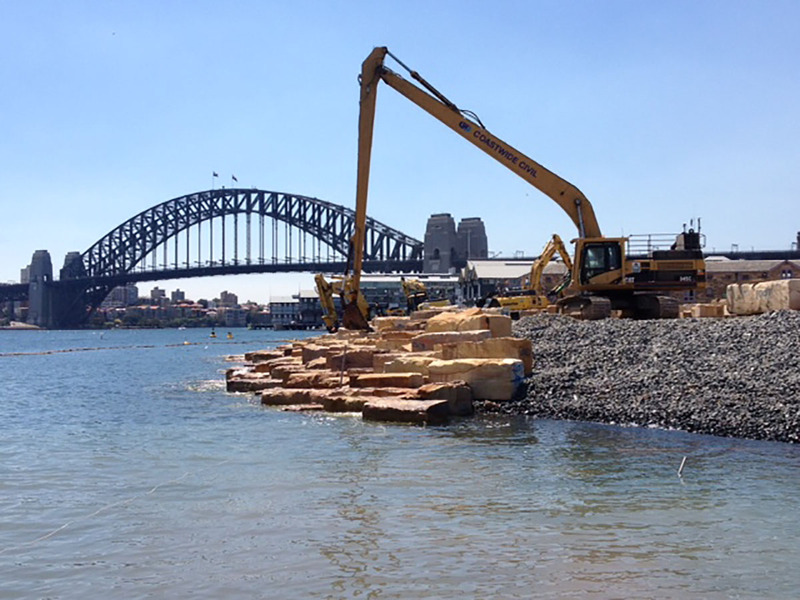 This work included the use of two long reach excavators and involved the bulk excavation of the harbour foreshore, dredging, placing scour rock for harbour floor, placing architectural sandstone blocks, prepping beds for boardwalk construction and placing all sediment and environmental controls.